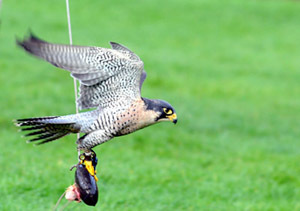 The official launch of Top Gun of the Sky took place at the Hawk Conservancy Trust on 9th November. 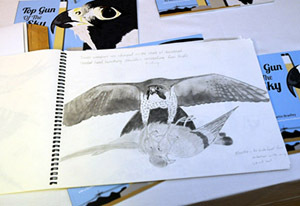 It is a poem based children’s book seen through the eyes of a Peregrine Falcon, written and illustrated by Fawley Refinery employee Martin Bradley. 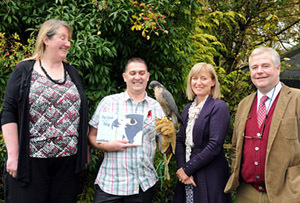 It is the first book Martin has ever had published and it’s purpose is to raise money for the Hawk Conservancy Trust and to help children learn more about this amazing bird. The story really started with some drawings he produced. His two boys, Jay and Max, looked at them and said “dad you’ve got to do something with these”. Martin spoke to Penny Smout, CEO of the Hawk Conservancy Trust and Ashley Smith, Executive Life President who both loved the idea and helped Martin present it to ExxonMobil. They bought into the idea and supported Martin, funding the printing of the book. Amongst other places, you can buy the book from The Hawk Conservancy, Waterstones and Ceratopia Books. A framed, signed picture from the book was presented to ExxonMobil and it will hang in their reception.